2 Column, CSS3 dropdown menu, Logo with hover effects, Social Sharing buttons etc. 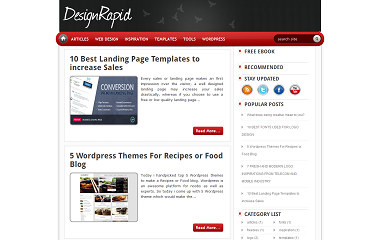 Descriptions Design Rapid Blogger Template is a elegant template. It has many premium features such as Hover Effect in Logo. It also has a beautiful Dropdown menu. Apart from this this template has and many more features. This template is good for all types of blog. 8 Person has expressed his thoughts, Now you turn guys! Yeah amazing piece of work by Ramandeep Singh..
HOW TO LINK THE (HOME,ABOUT US ) TO MY LABELS ?? Hello Dhiraj you design rapid theme is not downloading they are showing 404 error.